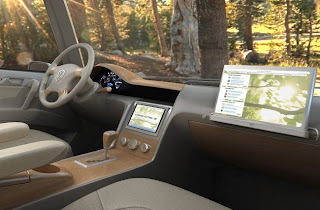 A Canadian designer, Alexandre Verdier, as come up with a VW Micro Bus concept vehicle. The actual bus does not exist just yet, but he has said he has lined up a manufactruer to build these customized vehicles. This is not your basic hippie V-Dub van! Plans are for the van to have a 4-speed automatic, with a turbocharged hybrid diesel engine. 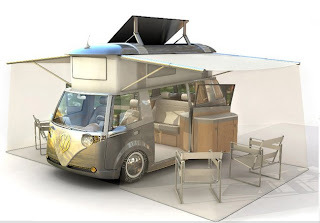 Mr. Verdier envisions the van being equipped with a Sun Tracker solar panel on the roof. The solar panel will be integrated with a GPS and onboard computer so that it will position the solar panel for the best possible performance. So, when you are not running on electricity, you can run on recycled cooking oil. How green! But, check out the pictures. The roof of the vehicle is adjustable in height. And, two huge awnings roll out from slots above the doors. This thing sounds like a Transformer! Now, most hippies won't be able to afford this. The version with the "full options package" is predicted to price out at around $129K. Still, McGyver would be proud of this bus.....it would go so nicely with his knife! For additional info on this concept car, check out Mr. Verdier's website.